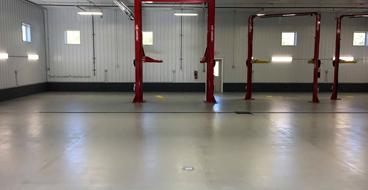 An epoxy flooring system offers unrivaled durability, longevity, and beauty with a low cost that makes it a great option for commercial facilities as well as residential use in garages, basements, and other living areas. As one of the leading epoxy flooring companies in Nampa, Idaho, we install industrial-grade 100% solids epoxy products in all types of applications with the attention to detail necessary for long-lasting and flawless results. Epoxy flooring is a liquid-applied flooring system made by combining hardeners and resins which chemically react to form an ultra-rigid and durable plastic material. Epoxy doesn't dry: it cures and bonds with your prepared concrete surface to protect the concrete and withstand everything from hot tires and chemical spills to heavy loads and abrasion. An epoxy concrete floor in Nampa, Idaho is a seamless surface with no grout lines or seams with nowhere for bacteria or grime to hide and easy maintenance requirements with no special products necessary. customers with high-quality epoxy flooring installation. We install only 100% solids epoxy formulated to withstand even the most demanding environments with a commitment to superior results. Here are our most popular epoxy services. No matter how you envision your garage, an epoxy garage floor coating can help you make it a reality. 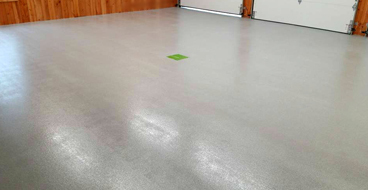 Our epoxy garage floor installers can transform your garage into clean, dry, and bright usable space with a decorative epoxy coating that can last up to 20 years. We make it easy to customize the look and feel of your garage with endless design options — all with an affordable installation cost and industrial-grade strength. Commercial facilities have unique needs when it comes to flooring. A floor system needs to be attractive and professional-looking while remaining free of wear and stains. It also needs to be hard-wearing to withstand constant traffic and demands like heavy loads, dropped objects, and spills. Of course, it should also be easy to maintain and long-lasting with a low lifecycle cost. Epoxy flooring in Nampa, ID meets all of these needs and more. Epoxy flooring is decorative enough for homes and commercial properties but it’s durable enough for even demanding industrial settings. Our epoxy flooring contractors in Nampa, ID install specialized industrial-grade epoxy systems for all types of industrial applications like breweries, manufacturing and processing plants, warehouses, airplane hangars, and much more. 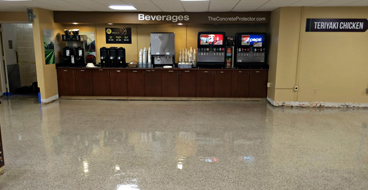 An epoxy concrete floor is resistant to chemicals, vehicle traffic, pressure washing, and even extreme temperatures. Looking for an elegant and upscale flooring system for your hotel, restaurant, retail storefront, showroom, or garage? Nothing compares to a metallic epoxy floor. Our custom metallic epoxy floor coatings in Nampa add a unique aesthetic element and high-luster, pearlescent finish to any space. Metallic epoxy flooring delivers a one-of-a-kind floor system with exciting visual effects adding depth, movement, and a multi-dimensional appearance. One of our most popular options is a granite epoxy flake or chip floor. This type of flooring is often used in commercial areas but it can also be a decorative form of residential epoxy flooring that adds subtle visual interest, color, and texture. We broadcast colorful epoxy flakes over your base coat of epoxy to create a unique granite look. Flake epoxy flooring also adds a safe, skid-resistant texture to your floor. Did you know you can get any look you want with epoxy flooring in Nampa, ID? The possibilities are endless, from solid colors and popular patterns like checkerboard to custom designs, logos, and metallic epoxy coatings. 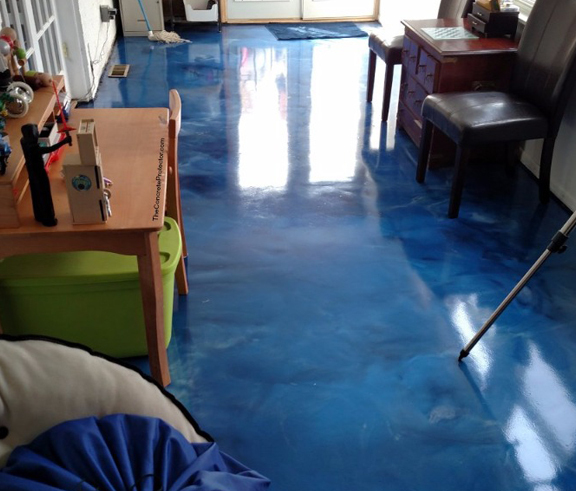 For some applications, a simple epoxy floor with a high-gloss color can be perfect. For safety concerns in non-public areas of a processing plant, brewery, or warehouse, striping can be used to designate forklift paths, pedestrian walkways, and more. Flake epoxy is an easy way to make a durable floor decorative with coordinating color. For a real “wow” factor in a garage, lobby, or restaurant, a metallic epoxy floor coating can be a good choice. Our epoxy flooring contractors can even do custom designs such as geometric shapes, flowing patterns, logos, graphics, and medallions.